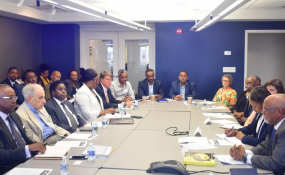 Washington, DC — On Tuesday, July 24, 2018, Corporate Council on Africa hosted a working group on Investment Opportunities in Eritrea, with guest speaker, Dr. Woldai Futur, Director, Eritrean Investment Center. CCA President and CEO, Florie Liser delivered the opening remarks, noting the historic change in the relationship between Eritrea and Ethiopia and its implications for investment in Eritrea. Before introducing the Eritrean delegation, Carol Pineau of Africa Today TV recounted her experience in Eritrea in 1998, when the war started, and recently in 2016, 18 years later. She described Eritrea as "a country that is self-actualized" and urged participants to "leave [their] assumptions at the door. The reality is completely different: roads are good, markets are doing well, and people talk freely about their country." She stressed the importance of understanding that Eritrea is a country that for the past sixteen years has been ready for peace and ready for business, going further to say that before the war, Eritrea was known for promoting the idea of 'trade over aid'. In his opening remarks, Dr. Futur thanked CCA for hosting such a historic meeting He acknowledged that Eritrea has had to play "catch up" with respect to integration into the global economy, but emphasized that "the engine of growth [in Eritrea] is the private sector", noting that from 1991-1998, the economy grew by 11%. The newly established relationship between Eritrea and Ethiopia has significant implications for Eritrea's ability to establish new trade/investment relationships globally. In 1991, Eritreans met in Asmara and debated what approach to take towards economic development. They chose an open-market economy-based approach. This strategy, he believes, will achieve the results Eritrea needs across various sectors. He highlighted the key role agriculture plays in ensuring food security in Eritrea, noting that investment in water harvesting techniques would significantly impact the agribusiness sector. He also acknowledged the potential of the Red Sea with regards to the fishing industry. Dr. Futur indicated that investment opportunities also exist in the travel and tourism industry, as well as the manufacturing industry. "We need manufacturing to solve the problem of the labor market", he said. He highlighted the textile and leather manufacturing industries and packaging industry as viable areas for investment. He stressed the need for financing within the mining industry, specifically with regards to mineral extraction. In closing, he affirmed that the peace dividend and the normalization of relations with Ethiopia will have massive implications for Eritrea and ended with a call to private sector stakeholders to invest in Eritrea's emerging sectors. Read the original article on CCA.